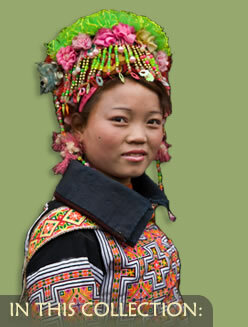 The Miao are one of several ethnic minorities living in the subtropical mountainous areas of southwestern China. Different groups include the Dong, Yi, Yao, Shui, Bouyi, Li, Gejia, and Bai among many others. For thousands of years, these migrating peoples have developed rich, cultural traditions and they are increasingly being recognized for their extraordinary handcrafted textiles and silver jewelry. It is the area of costume where mythology, technical skill, and cultural identity coalesce in vivid aesthetic expression. Until recently, most of these remote, ethnic villages were relatively isolated from the majority Han Chinese population. Chinas rapid modernization, however, has penetrated even the minority districts of Guizhou, Yunnan, Guangxi, and Guangdong provinces. The resultant economic, educational, and social changes have already begun to erode the look and use of traditional festive costumes worn by the Miao and other ethnic groups. In 1988, the Minneapolis Institute of Arts purchased eleven Miao textiles primarily as a point of contrast with the exceptional collection of Qing dynasty imperial silks owned by the museum. Since that time, the ethnic minority collections have grown to over 1400 textiles and nearly 500 pieces of silver jewelry. Datable primarily to the late 20th century, these works were all added through the generosity of private patrons who provided substantial gifts of funds for purchases, as well as dedicated collectors who donated their private holdings. It is hoped that this wonderful collection will add to further appreciation and understanding of China's highly accomplished, ethnic minorities and their art.